The four axle range MAZ 6516A8 is becoming bigger. Some new modifications are added. One of the newest is the dump truck MAZ 6516A8-520 with a semi-circular section dump body. Its volume is 21 cubic meters, and payload is 26.900 kg. 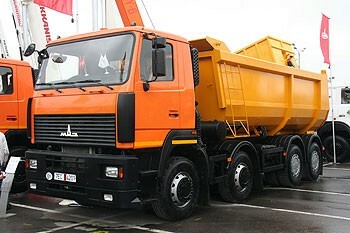 The truck became the first Belarusian truck, which meets to the standard Euro-5. Engine is 400 hp MAN D2066 LF41.